This recipe calls for Four and Twenty Blackbirds’ All-Butter Crust (partially pre-baked), although I cheated a little by using a frozen crust. I defrosted this, arranged it in a 9-inch pie pan, and put it in the fridge for 5-10 minutes. After this, I used a fork to prick the bottom of the crust. I lined the pie with parchment and poured in some pie weights (or beans) before setting it in an oven set to 400° F and baking for approx. 5-8 minutes. I then removed the parchment and weights and placed the pie back in the oven to brown for about another 3-5 minutes, or until slightly done. Then, just pop it in the fridge to cool and assemble the rest of the pie! Position a rack in the center of the oven and preheat the oven to 350° F.
Spread the oats on a rimmed baking sheet and toast in the oven for 10 to 12 minutes, stirring occasionally. Set aside to cool. I ended up putting the pan in the fridge for a few minutes as well. Lower the oven temperature to 325° F.
For the ganache layer, bring the heavy cream just to a boil over medium heat in a heavy-bottomed saucepan (I stirred it to keep from burning). Remove from the heat and pour in the chocolate pieces. Swirl the cream around to coat the chocolate; let sit for 5 minutes. Whisk gently until smooth. 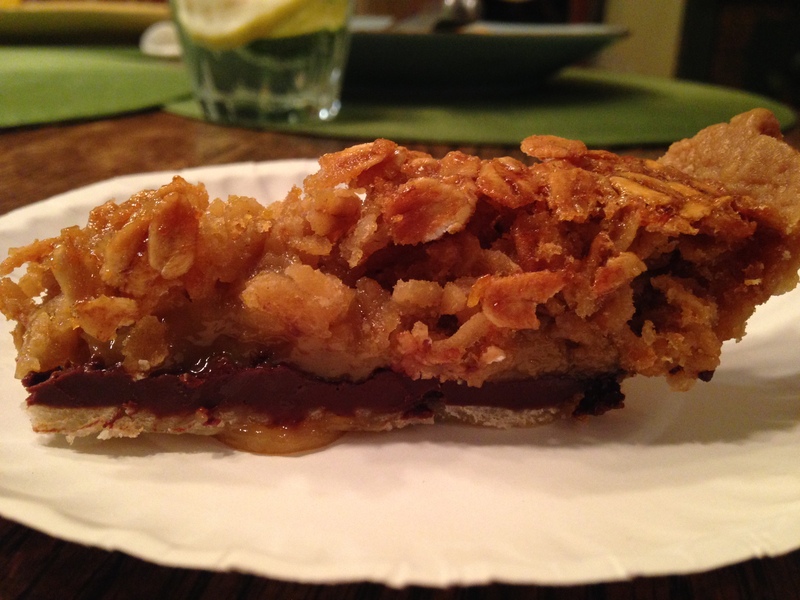 Scrape the ganache into the cooled pie shell and spread evenly over the bottom. Place the shell in the freezer to set the ganache while making the filling. You’ll know the ganache has set when it is relatively firm to the touch. In a large bowl, whisk together the brown sugar, ginger, salt, and melted butter. Add the corn syrup, vanilla, and cider vinegar and whisk to combine. Add the eggs one at a time, blending well after each addition. 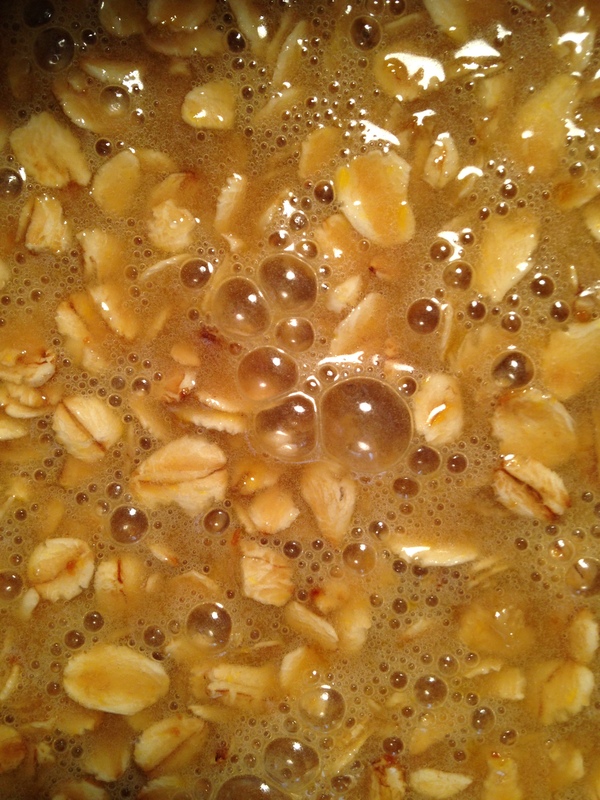 Stir in the cooled oats. Place the ganache-coated pie shell on a rimmed baking sheet and pour in the filling. Bake on the middle rack of the oven for about 55 minutes, rotating 180° when the edges of the filling start to set, 30 to 35 minutes through baking. The pie is finished when the edges are set and puffed slightly and the center is slightly firm to the touch but still has some give (like gelatin). The pie will still set some more as it cools, but you don’t want it to jiggle around too much when you shake the pan. Allow to cool completely on a wire rack, 2 to 3 hours. The pie will keep refrigerated for 3 days (although mine kept for longer) or at room temperature for 2 days. I covered it with tin foil for storage and stuck it in the fridge for storage. Oh, and P.S. : My good friend has a cooking blog of her own (called Bklyn Foodie) which can be found here. She posts amazing recipes and helpful restaurant reviews, so check her site out if you have the time! I never tried the original from the pie shop, but this was delicious. And yes, you did get the oats all over the floor :-)!